So here in Minnesota we’ve had an insanely long winter leading to being cooped up inside much longer than usual and one final bout of a cold running house-wide. There’s no better cure for a nasty cold than a warm bowl of chicken and dumplings. We are huge lovers of Tyler Florence and have found this recipe of his to be a go-to make-ahead and a definite favorite when you need a little comfort food. 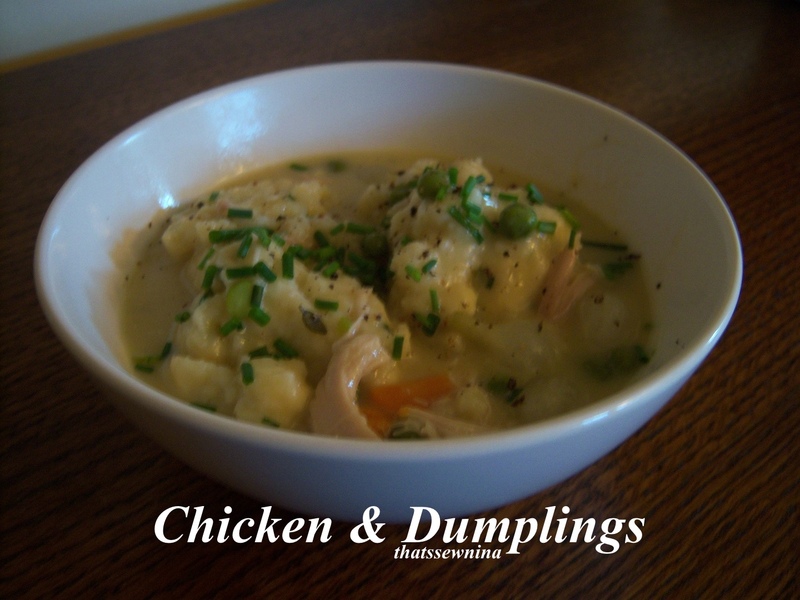 To make the dumplings, sift the dry ingredients together in a large bowl. In a small bowl, using a whisk, lightly beat the eggs, chives and buttermilk together; pour the liquid ingredients into the dry ingredients and gently fold. Mix just until the dough comes together; the batter should be thick and cake-like. To prepare sauce, in a Dutch oven, over medium heat, add the butter and oil. Add the carrot, celery, garlic, and bay leaves and saute until the vegetables are soft, about 5 minutes. Stir in the flour to make a roux. Continue to stir and cook for 2 minutes to coat the flour and remove the starchy taste. Slowly pour in the chicken stock, 1 cup at a time, stirring well after each addition. Add frozen peas and pearl onions. Let sauce simmer until it is thick enough to coat the back of a spoon, about 15 minutes. Stir in cream. Fold the shredded chicken into the sauce and bring up to a simmer. Using 2 spoons, carefully drop heaping tablespoonfuls of the dumpling batter into the hot mixture. Tyler writes that “the dumplings should cover the top of the sauce, but should not be touching or crowded” but I say, yeah, right! Unless you have a huge dutch oven, they’ll probably crowd the top. Mine always turn out fine anyway. Let the dumplings poach for 10 to 15 minutes until they are firm and puffy. Remove and discard the bay leaves. Season with freshly cracked black pepper and garnish with chopped chives before serving. see? told you we always crowd the pot! 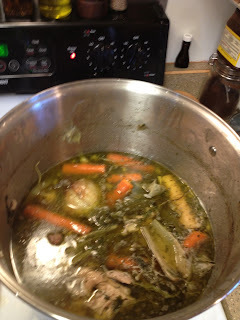 Make your own chicken stock! Yum! Seriously, Carl and I make a bulk of chicken stock a few times a year so that we're always using homemade stuff. I'll be sure to do a full post on this sometime soon but if you want to give it a shot, I think Ina Garten has got it right. Check it out!